On average, a sales team member stays less than two years in a position while the average time for that very same team member to be full on-boarded is and ready to sell is around six months. Creating a comprehensive on-boarding plan for new employees will reduce training time, increase training efficiency, maximize sales success, and decrease turnover of team members. The earlier the sales representative can start working with customers and start closing deals, the quicker he or she will impact the company's bottom line, translating into even higher revenues. A detailed and easily-accessible knowledge base with comprehensive sales collateral for your team will save each sales rep. hours of searching for the right content to share with potential prospects and existing clients. Quickly accessing high-quality content to share will allow sales reps to manage and track more leads simultaneously. To be successful on a sales team, maximizing volume is essential. With more leads, each rep. can set higher targets, which translates into more total revenue brought in. 3. Create a general “talks" group so the team can share knowledge with each other. 4. 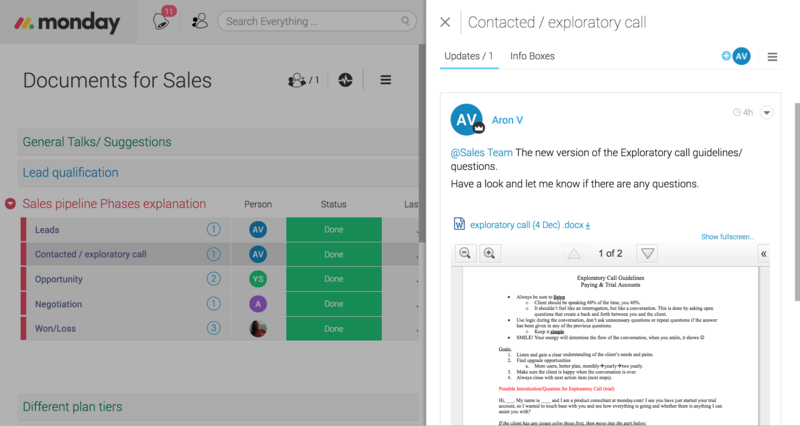 Keep your communication in context on each topic and easily update the team when anything new is added. This allows for instant feedback. And voila! Your team is ready to start selling. Being aligned with other departments across the company is crucial in making successful sales. It is essential to be up-to-date on new features the R&D team is releasing, relevant campaigns the marketing team is running, and having effective channels to communicate the pain points you identify as a sales team when working with new clients. This feedback allows the product team to improve the offering. 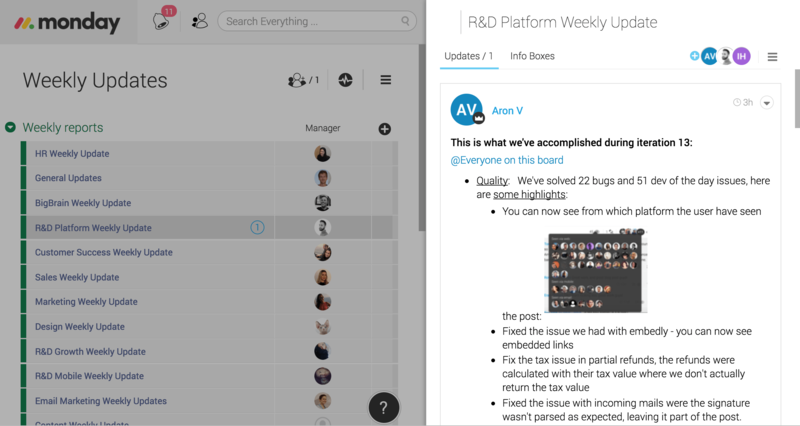 A great way to organize this effectively is to have each team manager distribute an update on a weekly basis of what their department has been working on. 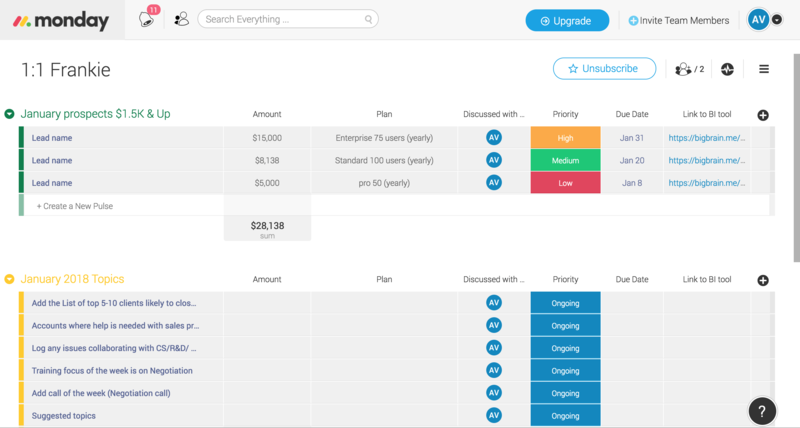 It's crucial that the update is made on a transparent platform that easily allows searching for information and accessible updates to all stakeholders with one click. A sales pipeline is a visual representation of the sales process divided into various stages. 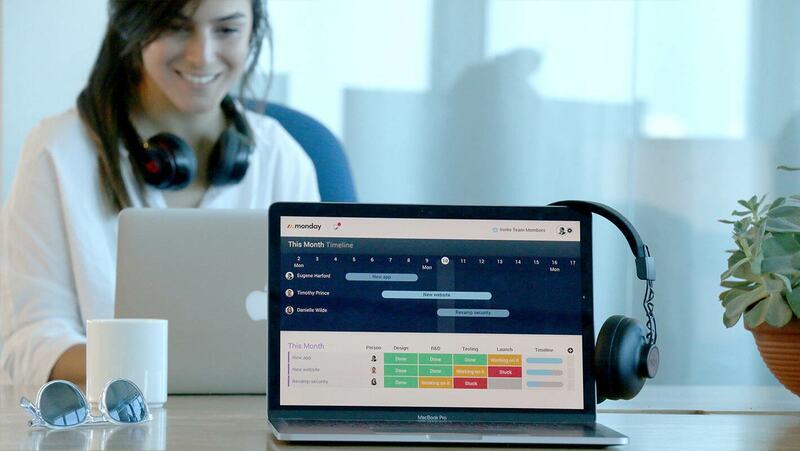 Utilizing an organized and effective sales pipeline allows the team manager to be updated on what the team is working on and accurately forecast the results for coming months. Most importantly, it will help each sales rep. to manage their processes, close deals, and stay focused on the most relevant and promising prospects. To constantly be striving for improved results, team training should be viewed as an ongoing process that is personalized to the strength and weaknesses of each team member. 1-on-1 meetings are crucial to ensuring each sales reps will continuously improve. A great way to organize these meetings is reviewing relevant leads that the sales rep. works with and together, identifying areas for improvement in the process. This includes identifying opportunities, effectively managing time, and increasing value for customers. The meeting can be divided into different topics. For example, the first part can be dedicated to discussing opportunities in the pipeline (group 1) and the second part can be focused on improving sales skills (group 2).